Bishop Emeritus Herbert Hermes, OSB, 84, died Jan. 3 of complications from pneumonia. Much of his ministry was in Brazil where he was bishop of the Prelacy of Cristalandia. KANSAS CITY, Kan. — The letter then-Father Herbert Hermes, OSB, received from the apostolic nunciature in Brazil was most unwelcome. With apprehension, he opened and read it at midnight on June 9, 1990. At the time, the monk from St. Benedict’s Abbey in Atchison was assigned to the abbey’s mission outreach — St. Joseph Priory in Mineiros, Brazil. And the letter contained an important question. Would the Kansas monk accept the Holy Father’s appointment to become bishop of the Prelacy of Cristalandia? The Benedictine, born in Shallow Water, came from a modest, working- class family in this small Kansas town. “I didn’t feel comfortable with the prestige of [being] a member of the hierarchy, with a title ‘prince of the church,’ with reverences and kissing of my hand,” he said. Cristalandia was a land so poor and the church there so weak that it couldn’t even rate as a diocese. The prelacy had experienced four years of neglect because the previous two bishops were limited by serious illnesses. Prayer did not yield the monk the answer he’d hoped for. “The phrase, ‘They are like sheep without a shepherd,’ kept bombarding my thoughts,” he said. “Finally, at 4 a.m., I gave in and accepted trying to be ‘pastor’ of this ‘flock without a shepherd,’” he continued. Father Hermes was ordained a bishop on Sept. 2, 1990. And what a shepherd he was. He worked hard — and effectively — to build up the church spiritually and temporally. He was a tireless advocate for human rights, so much so that, for a time, he was on a hit list of a death squad sponsored by powerful business interests in Brazil. 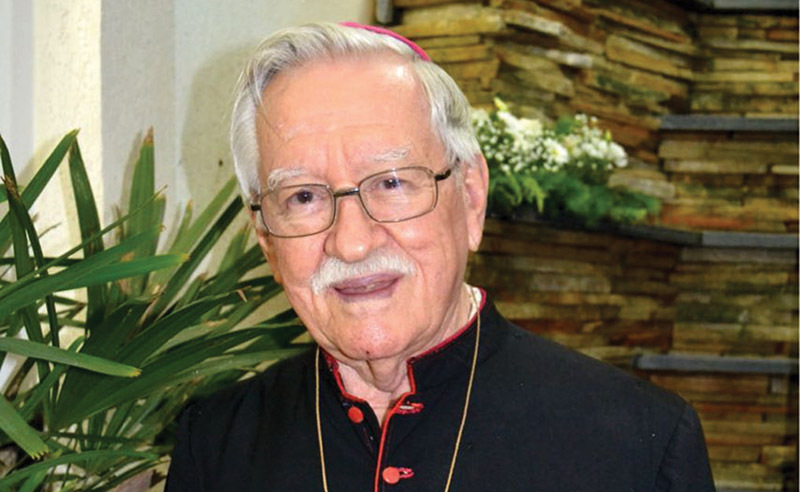 Even after he retired to St. Joseph the Worker Parish in Paraiso do Tocantins in 2008, Bishop Hermes continued to advocate for the poor and oppressed. On Jan. 3, however, the poor and oppressed of Brazil lost a shepherd. Bishop Emeritus Hermes, 84, died of complications from pneumonia at the General Hospital of Palmas, Tocantins. A funeral Mass was celebrated at St. Joseph the Worker Parish. He was buried in the crypt of the Cathedral of Our Lady of Perpetual Help in Cristalandia, Tocantins. Bishop Hermes was born on May 25, 1933, in Shallow Water, about eight miles south of Scott City. He was the ninth child of John Nicholas and Mary Ann (Hilger) Hermes. He was born five minutes before his identical twin brother Norbert, the family’s tenth child. The future bishop and Norbert learned from their older brothers to serve Mass at St. Joseph Parish in Scott City, where the family had moved. Bishop Hermes was educated in public schools and, after high school graduation in 1951, went to St. Benedict’s College in Atchison, which was run by the Benedictine monks of St. Benedict’s Abbey. He became a novice on July 11, 1954, and took solemn vows in 1957. He also graduated in May that year with degrees in biology and philosophy. He completed theological studies and was ordained a priest on May 26, 1960. At the time, St. Benedict’s Abbey was establishing a mission foundation in Mineiros, Brazil. “I volunteered as a [transitional] deacon and was accepted after [priestly] ordination,” Bishop Hermes said in a 2011 interview. When he arrived in Brazil in October 1962, the future bishop couldn’t speak a word of Portuguese. After a 16-week course, he began his ministry in February 1963 at St. Joseph Priory in Mineiros. He became pastor in 1972. Bishop Hermes was active in many organizations promoting the human, social, political and economic rights of indigenous and poor persons, who were often exploited and victimized by powerful alliances of corrupt government and business. He exposed the practice of modern slavery and worked to rescue the enslaved. In 1994, he created the Center of Human Rights of Cristalandia and established offshoots called Human Rights Nucleos. In 2002, he received national recognition as a Distinguished Personality in Human Rights. “Bishop Hermes understood that the basic need of many people was to own their own piece of land and learn a basic trade to escape poverty,” said Joel Hermes, a nephew who belongs to St. Michael the Archangel Parish in Leawood. “The bishop knew full well the dangers of taking on the elite class and speaking out for the impoverished. A niece, Lori Wilbur from Little Rock, Arkansas, remembered how the whole family would gather for reunions when Bishop Hermes visited. Her father Norbert, she and her siblings would all help distribute the bishop’s newsletters and promote his causes. She came to understand why the Latin word “fiat” was on his bishop’s miter. Bishop Hermes inspired a cousin and a nephew as they sought their own vocations in the priesthood. Not only did he baptize his nephew Father Alphonsus Hermes, O.Praem., he also ordained him a priest on June 29, 2001. A cousin, Father Michael Hermes, pastor of St. Paul Parish in Olathe, was also ordained by Bishop Hermes. The bishop would often stop in to see him on visits to see family in Kansas. “I think he was a true missionary,” he continued. “He adopted himself into Brazilian culture and into the church in Brazil. He loved Jesus. He loved the church. He loved Brazil. He loved the people of Cristalandia. Bishop Hermes is survived by two brothers, Norbert in Salina and Eugene in Montana; a sister, Lucilla Herman in Oklahoma; nephews and nieces; and his brother monks and priests at St. Benedict’s Abbey and the Prelacy of Cristalandia. He was preceded in death by his parents, three sisters and four brothers. Memorials in honor of Bishop Hermes may be sent to St. Benedict’s Abbey, 1020 N. Second St., Atchison, KS 66002, for the mission of the monks or for the formation of priests in the Prelacy of Cristalandia. Bishop Herbert Hermes’ oldest brother, Eugene Hermes, 100 yrs. in July 2017, Whitefish, MT, died later in January 2018. Beloved Missionary Bishop Herbert Hermes!! Minnesota and @ his nephew’s Ordination @ the Norbertine Abbey in Los Angeles. My sister, Marlene, is married to Norbert Hermes, Bishop Herbert’s identical twin.